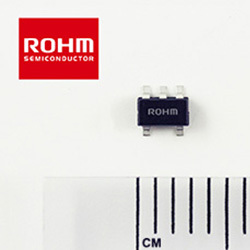 ROHM has added an op-amp that produces what is claimed to be the industry’s best performance against external noise optimised for consumer devices and industrial equipment. The LMR1802G-LB, developed using the company’s analog technology covering circuit design, processes, and layout, decreases input equivalent noise voltage density by half (2.9nV/√Hz at 1kHz, 7.8nV/√Hz at 10Hz) opposed to conventional products, significantly increasing the detection performance of sensor signals. Also, best-in-class phase margin (68-degrees) and capacitive load tolerance (500pF) offer exceptional stability (difficult to oscillate, easy to handle). This allows accurate amplification of voltages in the order of µV, assuring support for applications demanding high-precision sensing. The device is ideal for applications that demand high-accuracy sensing, including sonar and optical sensors.